Rindler Creek flows out of the hills to the east of Vallejo, down into Lake Chabot. It attracts a fair amount of trash, unfortunately, and it’s time for a spring cleaning! 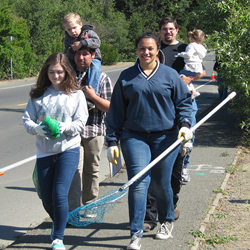 The cleanup will take place on Saturday, May 16, from 9:00 a.m. to noon. Meet at the corner of Fairgrounds Drive and Coach Lane. Wear sturdy clothes and shoes, gloves, hat and sunscreen. We will provide tools, trash bags, water, and refreshments. Participants under 18 must have a signed waiver (see Volunteer page). Please RSVP: info@VallejoWatershedAlliance.org. See you there!